Terror arrives in Canada – but whose? New anti-terror legislation will, according to its proponents, show terrorists that Canada will “never be intimidated.” But many Canadians themselves are more than a little intimidated by Bill C-51. On October 22, 2014 32-year-old Michael Zehaf-Bibeau killed Corporal Nathan Crillio at the Canadian National War Memorial with a .30-30 calibre Winchester riffle, a firearm typically suited to hunting deer. Driving the short distance to Parliament Hill, he then entered Centre Block, to be killed minutes later, leaving much of the downtown core on lockdown. Two days before in Saint-Jean-sur-Richelieu, Quebec, 25-year-old Martin Couture-Rouleau ran down two Canadian soldiers with his car, killing one, and Canada’s terror threat level was raised to medium. Terror had arrived in Canada. And no one seemed prepared. Hours after the Ottawa shooting, Prime Minister Stephen Harper explained how Canada would “never be intimidated,” in a statement that permitted his Conservative Government to fast-track new anti-terror legislation, Bill C-51. Over 100 academics have argued that there are major problems with the bill. Bill-C51, which has passed its second reading before Parliament, seeks to reform laws already in place by making the promotion or intentional advocacy of terrorism illegal, removing such propaganda from the Internet and lowering the thresholds for terror arrests from acts that ‘will’ to those that ‘may’ be carried out. Information sharing by government arms - previously having led to injustices - also expands. According to a critique released by law professors Craig Forcese and Kent Roach, “It is, quite simply, the broadest concept of security that we have ever seen codified into law in Canada.” Along with Forcese and Roach, over 100 academics have argued that there are major problems with the bill. Much criticism, including from four former Prime Minsters, has focused on oversight methods- ones governing these bodies remaining minimal and unaltered for the increased power needed to deter “violent jihadism”, as told by Harper when first introducing the bill on January 30th 2015. Civil liberty organizations have also expressed concerns. OpenMedia has campaigned against the growing culture of secrecy and closed government initiatives brought on by the Harper government - ‘Stop Spying On Us’, a Bill C-51 canvass, now with over 21,500 supporters. Attempts to pass obscure legislation allowing for security services to monitor online space have been repeatedly deemed too extensive and unconstitutional. Laws like these are comparable to Bill C-51- expanded authority for CSIS with implications of abuse through the sweeping language used. Yet despite opposition - and Snowden documents confirming mass surveillance by Canada’s intelligence community - when introduced alongside military crisis or public tragedy, many regulations such as this have been passed. It’s hard to vote against an anti-terror bill. 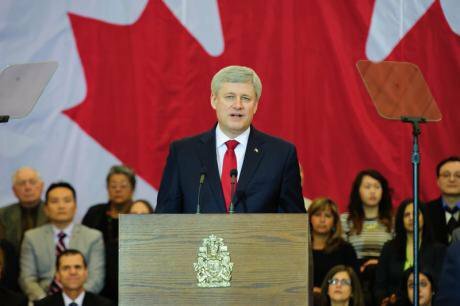 Fear was there on 9/11, causing Canada to pass its Anti-terrorism Act months later. After the October 22 attack, fear is there again now. In the House of Commons after the October shooting in Ottawa, Harper hugged Liberal Opposition Leader Justin Trudeau in a moment of solidarity - Trudeau is supporting the legislation, while opposition party the New Democrats (NDP) are not. Similarly in 1970, Trudeau’s father and former Liberal Prime Minister Pierre Elliot, suspended civil liberties in order to curb the Front de Liberation du Quebec (FLQ)- a Quebec separatist group who had been regarded as a terror threat. Here, with more power and no accountability for security agencies, violations to privacy and basic freedoms occurred. Reforms were put in place, and then forgotten until a subsequent intelligence transgression transpired. Examples like these are far too familiar in Canada’s history. Bill C-51 comes with little memory of the past and relatively no regard for social and political factors differentiating Canada from its western allies- a pluralist society with its implementation of multiculturalism admired globally. Much of Dawson’s research focuses on radicalization and Canada’s ‘foreign fighter problem’. Part of the response to the latter saw the arrest of Mohamed Hersi in July 2014 under the country’s 2013 Combating Terrorism law - making it illegal to leave Canada to engage in terrorist activity overseas. Hersi was the first Canadian charged under these measures. A 2014 Public Safety report on ‘The Terrorist Threat to Canada’ cites more than 130 individuals with links to Canada suspected of supporting terrorism-related activities abroad. You can’t stop every single act of violence by driving it underground. While some do not, Dawson believes that the Zehalf-Bibeau shooting was terrorism. Critics of Bill C-51 have said these new laws aren’t necessary and that the Canadian government has failed to demonstrate how current legislation is unable to reprimand acts of terror or how these new laws could prevent lone wolves like Zehalf-Bibeau. Despite ‘jihad terrorism’ being mentioned in Parliament, the breadth of Bill C-51 remains frightening. The way the bill is framed is extremely disconcerting for Palestinian human rights activists. Bill C-51 also designates a new felony of those who interfere with ‘critical infrastructure’, something that worries organizations like Greenpeace, who have been called ‘violent extremists’ alongside Aboriginal groups opposing tar sands and pipelines. When asked how Bill C-51 would distinguish between factors like these, Harper replied with, “whether they’re in a basement, or whether they’re in a mosque or somewhere else,” promoting terrorism would be a serious offence for anyone. The National Council of Canadian Muslims (NCCM) took issue with that, Canada’s Muslim community having disproportionately felt the affects of 2001’s new security procedures. Dawson is concerned as well. He believes that Bill C-51 could help reprimand real treats, but also wonders what negative effects new laws could bring. Under Bill C-51 the possible polarization of society is unknown. Whether it will be illegal for a journalist to write something, a not-for-profit to give funding or land protestors to campaign, is also uncertain. For decades, acts of terror have been a live issue in Canada, defined loosely by what the government determines is a threat to national security. For decades, acts of terror have been a live issue in Canada. Currently, the bill sits before committee where experts give testimony in a number scheduled meetings- the 4 meetings set originally, have now increased to 9. Whether this extension of debate is due to public outcry, the Conservatives are still set to move quickly with passing the legislature- expected in its third reading by the end of the month. But if Harper is right to say that war has been declared on all those who value “freedom, openness and tolerance,” it must now be added that holding a government to account is fast becoming the true measure of democracy.